This article is from the Winter 1999 AFRMA Rat & Mouse Tales news-magazine. Whether you think of show animals or pets, all rats and mice have “Type” or the way it’s put together that is important. What on earth is “Type”? This is one of those terms that fanciers discuss constantly, often to the complete confusion of those folks who are new to the world of showing animals. According to the American Heritage College Dictionary, type is defined as “An example of a model having the ideal features of a group or class.” Thus, when we discuss a particular animal’s “type,” we are comparing its physical features to an imaginary ideal. A detailed description of this ideal image can be found in the first page of the AFRMA rat and mouse standard. The standard is meant as an ideal guide, which all breeders should strive to come close to meeting. 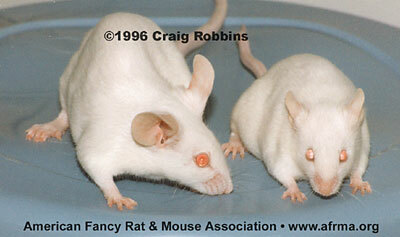 When you read the rat and mouse standards, it quickly becomes clear what show rats and mice are supposed to look like. Remember though . . . the standard is considered an almost unreachable ideal. 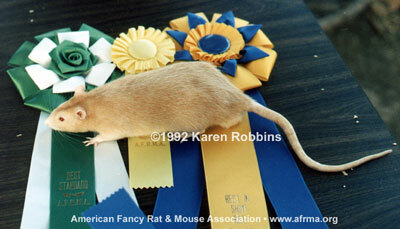 The closer to it the rat or mouse is, the higher a judge will place them at a show. TYPE – The general appearance should be pleasing to the eye, with good outline and inquisitive attention. The body should be long and somewhat racy in appearance, and show strong bone. The loin should be well arched. CONDITION – Animals should be maintained in good weight, to emphasize their good qualities. The coat should be short, smooth and glossy, (except Rex) with the males having somewhat longer and coarser hair. It should show a natural high shine and densely cover the body. HEAD – The head should be long and clean in outline, not too fine or pointed at the muzzle. The skull should show breadth as well as length and have good width between the eyes, as well as the ears. The whiskers at the muzzle should be well developed, being long and straight (except Rex). EYES – The eyes are to be large, bold and prominent, showing animation and interest. EARS – The ears should be set far apart on the head, standing erect, and being free from folds or creases. They are rounded in shape, and of good size. TAIL – The tail should come out of the back, and be thick at the base, tapering to a fine point, and is to be free of kinks. The length should be equal to the body, or slightly longer. SIZE – Size is not to disqualify any rat, but all other things being equal, the larger animal shall have the advantage. The average size should be eight to ten inches in length, measured from nose to tail set-on, with approximately the same length for the tail; males being slightly larger than the females. GENERAL – All rats must be tractable and easy to handle. Any evidence of physical defects or unsteady temperament, shall be penalized by the judge, and will subject the individual exhibit to elimination. All faults listed are to be considered equally when placements are made, with no one fault to be more serious than any other. TYPE – The general appearance should be one of sleekness and alert attention and be pleasing to the eye. The body should be long and slim, racy in appearance, yet show strong bone. The loin is to be well arched. CONDITION – Animals should be maintained in good weight, to emphasize their natural good qualities. The coat should be smooth and glossy (except Frizzies), and feel fine to the hand. It should show a natural high shine and densely cover the body, including the belly, groin, area around the front legs, and behind the ears. HEAD – The head must be long and clean in its lines, not too fine or pointed at the muzzle. The skull should show breadth as well as length, and have good width between the eyes as well as the ears, and good distance from the ears to the eyes. The muzzle should show a curved roman nose outline when viewed from the side. The whiskers at the muzzle should be well developed, being long and straight (except Frizzies). EARS – The ears should be large and thin, almost transparent, carried high on the head and facing forward, giving the expression of alert inquisitiveness. They should stand erect and be free from folds, creases or nicks. There should be plenty of width between the ears, but not so much as to lose the proper expression. EYES – The eyes are to be large, bold and prominent, showing great animation and interest. TAIL – The tail should come out of the back and be thick at the root, tapering gradually to a fine point, and is to be free from kinks. The junction with the backbone should form the apex of a well-defined triangle, based on the hips. In length, the tail should equal that of the body or be slightly longer. SIZE – Size is not to disqualify any mouse, but all other things being equal, the larger animal shall have the advantage. The average size should be eight to nine inches in length, measured from nose to tail tip. These two mice are the same age. The pure English mouse on the left shows a larger ear size, longer, racier body, and thicker tail. GENERAL – All mice should be tractable and easy to handle. Any evidence of physical defects or poor temperament shall be severely penalized by the judge, and will subject the individual exhibit to elimination or disqualification. All faults listed are to be considered of equal seriousness when placements are made, with no one fault to be regarded as more damaging than any other. You may be asking “why on earth does it matter how a rat or mouse is built.” Admittedly a pet rat or mouse can be put together in any of a thousand ways and still be a great pet. 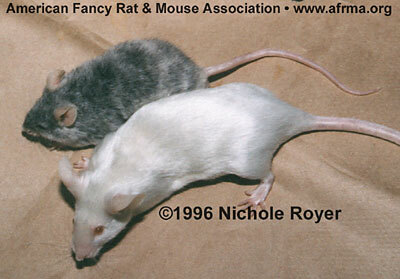 These two adult male mice show a difference in body length and shape. 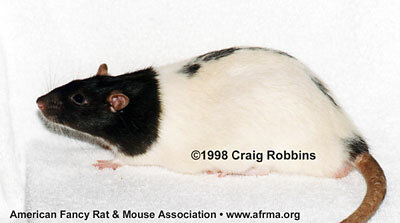 The dark pet shop mouse (“American”) is much shorter and compact, where the white show mouse (purebred English) has a much longer, racier body with a much thicker, longer tail. Ear size is also much larger on the English. This is what a hundred years of selective breeding can accomplish. Even just crossing a pet shop/American mouse with the show/English mouse can achieve competitive show animals in just 1–3 generations. With just a few years of selectively breeding pet shop/American mice you can produce animals that are “Typier” than the original stock. Of course, a typey animal is also a pleasure to look at and to watch move. If you show rats and mice, type becomes doubly important still simply because half of what it is judged on is its type. Color and markings make up the other half. Breeding for good type is very important — and much more difficult than breeding just for good color and markings. A breeder who produces an animal that has the expected nice temperament and good health, as well as excellent color, markings, and type, has truly reached the ultimate goal of all fanciers. This is when breeding animals goes far beyond just a science and becomes a true art form. Unfortunately, breeding good type is not simple. Unlike color and markings, type is not controlled by a small handful of genes. Instead, many are involved. Each part of the animal is usually determined separately, thus an animal with beautiful eyes and ears may have a very poor head and tail. The first step in breeding for good type is to take a serious and unbiased look at your own animals. What are their faults, and can you see problems that have been passed down through the generations. You also need to know your animal’s strong points. In what ways do they (and their whole family) excel. A good way to find these things out is to take your animals to shows. Not only can you get the judge’s opinion on your animals, but you can ask other fanciers as well. Just remember, when you ask someone’s opinion, that’s just what you are likely to get. Opinions can vary greatly. Use what is helpful, and throw out that which is not. Don’t take it personally when someone comments unfavorably on your animal — remember, you asked! Once you know your own animal’s strong and weak points, you can go in search of the “perfect” match. You want to find an animal with color and markings complementary to yours who excels (and whose family excels) in all those areas where yours do not. When you breed this animal to yours, don’t expect miracles. Often you will get a mishmash of un-uniform babies. With some careful selection, however, you should be able to find a male and a female who between them have all the qualities you are looking for. Breed these together and in most cases you will get several babies who are a definite improvement over your original stock. You may also get some who have the worst of all features (luck usually dictates that these are the ones with the best color/markings) so selection is always very important. To top this all off, I will admit that there is most definitely an element of luck involved in breeding for type. I have seen a number of animals with beautiful type come out of pet shops, and seen breeders produce poor type out of breedings involving animals who are beautiful. The old adage among animal breeders is “first you have to breed them right, then you have to feed them right.” This applies to rats and mice as well as all other animals. These two rats show poor condition and type. They are very thin, have very thin, square tails, and rough coats. This is caused in part by poor husbandry. Even though an animal may have the potential for beautiful type, if it does not receive the proper care it will not reach that potential. This starts with the health and care of your females before they are ever bred. It includes her care and feeding throughout the pregnancy, and while raising those babies. From weaning on, all external factors including feeding, housing, bedding, handling, etc., etc., etc., play a part in how that baby is going to turn out. So there you have it. Type is simply the way a rat or mouse is put together. The rat and mouse standards set the “ideal” type by which all animals are measured. “Typey” rats and mice come close to meeting the standard, those with poor type do not. Breeding for animals can be difficult, frustrating, and sometimes seems darn near impossible. Producing that beautifully typey rat or mouse, however, can be one of the high points in any breeder’s time in the fancy. This Silver Fawn male shows excellent type having a long body, long tail, sleek coat, nice head and ears, and is in excellent condition. Now, I will readily admit that with a 100 year history of fancy mice, the folks in England have an enormous head start on us in producing mice with exceptional type and temperament. If we had 100 years to breed mice, ours would look like the ones overseas. The mice commonly found in pet stores here in America, and in many fanciers mouseries, have not been selected for good type at all. Instead they have been subjected to many years of selection based on being able to produce the greatest number of young in the briefest amount of time with a minimum of care and feeding. While these characteristics may be ideal for producing reptile food, they do not lend themselves to creating an animal with nice type, good temperament, or a long lifespan. Mice that have not been selectively bred for good type, tend to be small, round, skittish critters with small ears, and tails that look like they were stuck on as an afterthought. They look this way whether they are born in the U.S., Canada, Africa, Antarctica, or yes, even in England. If those of us here in the U.S. took these little untypey mice and selectively bred them for many many years concentrating on long racy bodies, whiplike tails, and large ears, we would eventually produce pure American mice which were indistinguishable from their English counterparts. Fortunately, there is a short cut. Thanks to a number of American fanciers, mice with beautiful type have been imported from England and the lines kept pure. Breeding these mice who come in only a limited range of colors to mice with poor type but who have colors or markings unavailable in pure English stock, produces animals of the desired color who have much improved type. Though they may not be as nice as their pure English parent, these “first cross” mice represent a step in the right direction. Continued breeding, with type in mind, will produce animals with really nice conformation. Thus we can bypass 100 years of selective breeding and come up with the same result in 3 or 4 years. So, is it wrong to say “English Mouse” or “American Mouse.” Well, not really. I would say instead that those terms are usually used in a very inaccurate fashion. The only mice entitled to be called “English” are those who can trace their ancestry back to England with no outside breeding involved. Some of these English mice have exceptional type, others do not. Just being English does not give a mouse good type. The opposite is also true . . . having good type does not make a mouse English. There are “American” mice who have very nice type and can be very competitively shown against their English counterparts.